hello im new to this forum hopefully I posted this on the right one! I’m curious what everyone’s opinion on my set up is before I commit and buy the chameleon. the tank is a 55 gal aquarium, I was aware that glass enclosures are not exactly ideal for chameleons due to the lack of air flow and ability to climb. So what I did was build an additional screen layer above. This doubles the height of the tank, and, allows me to significantly increase the air quality and air flow of the tank. Now I added clay balls to make some sort of way for excess water to not pool and rot the plants. (kind of reminds me of an aquifer.) this allows me to mist the tank without flooding the plants or causing stagnant water to raise humidity levels. I’ve incorporated several plants primarily golden pothos for a vining plant which should spread to the canopy eventually and ficus Benjamin for a shading plant. The substrate is packed with isotopes and springtails to further clean the tank and prevent molds from being an issue. I also placed several sticks about the tank to provide plenty of climbing space and varying basking points for my guy. 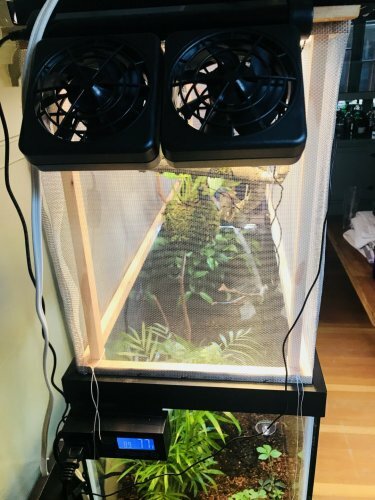 I have a t5 hood with reptisun 10.0 uvb lights in it, as well as two 150 watt basking bulbs to provide the optimal basking temps of about 88-90 degrees. The shaded temp is about 65 degrees consistently. humidity stays at around 50% consistently except, when the fogger goes off. I haven’t decided if it should be twice a day for 30 minutes or just once. The fogger provides water to collect on all the leaves which, as far as I’m aware should provide all the water needs for the chameleon. Going back to ventilation I added 2 mini fans that I have automated to turn on for 10 minutes every hour during the light cycle. This really helps circulate the air and maintain moderate to low humidity. So that’s my set up I’ll add pictures so you can see how it looks. basically I want to know if this is enough? I really care about all the animals I decide to take care of, and if I invest in this chameleon I want him to be as content as he can be. Also my apologies for the HUGE post I guess I had a lot to say haha..
And all those wires will be moved, I’m just trying to get as consistent of a temperature read as I can. If you fill out this form, we can make sure your husbandry is 100% as well https://www.chameleonforums.com/how-ask-help-66/ I really appreciate your dedication to giving any pet the best possible life! I have been basing everything off of the idea of having a male veiled chameleon because they live longer and have more color. The dimensions of the tank are 3 feet tall, 4 feet long by 1 foot wide... Which brings me another question because i was already concerned about width i figured i could make up for the width in height is that ok? or is it just not going to work? Also i love the idea of adding leaf litter i will definitely do that i think that would make the tank look more natural and it seems it would prevent the dirt eating issue! 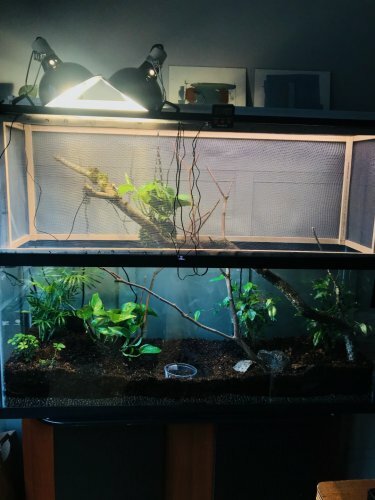 Ok heres my idea based on what you have said i will add leaf litter to the ground of the tank, add more sticks and vines. I don't want to spend another 200$ or more buying an entirely new cage... So, i'm thinking what if i just build another top to the tank that is 3 feet wide and 4 feet tall. This would make the tank dimensions 5 feet tall by 4 feet long and then the upper width would be 3 feet wide. obviously with the glass base being the same foot in width. 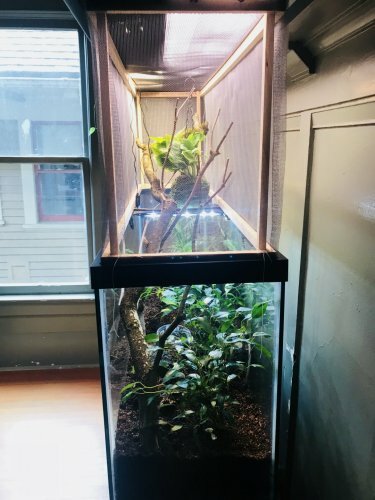 And yes, I am set on a living vivarium the main attraction will be the plants and foliage considering the chameleon is a pretty shy animal and will be more in the background of what i had in mind..
You can build a 2’ by 2’ by 4’ tall screen cage for $80 or less or buy one for $99. What would be the depth of the new top? The depth would be 2 feet doubling the current depth that should be enough space right?